Bostik's Best is a one-part, trowel-applied, moisture-cure, urethane adhesive. Once cured, its superior elastomeric properties provide a tough, flexible, tenacious bond to a variety of surfaces. 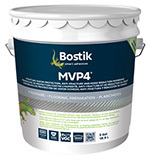 The elastomeric characteristics of Bostik's Best allow the adhesive to move with wood as it expands and contracts. This scientifically-formulated adhesive is not affected by exposure to moisture or water. Bostik's Best contains no chlorinated solvents or ozone depleting chemicals. It complies with all current state and federal regulations for Volatile Organic Compounds (V.O.C. Compliant). Bostik's Best is currently the number one selling urethane in the hardwood flooring market.